Out in the wild, a new type of technology is helping the fight against animal extinction. National Geographic call wildlife poaching a ‘global epidemic’ for a reason. Elephants, sharks, rays, whales, pangolins, rhinos – the list of species on the endangered list increases every year as the network of poachers, distributors and buyers become increasingly sophisticated. But could the Internet of Things signal the end to extinction? No area is affected by animal poaching as much as Africa, and no animal as much as the rhino. It’s an international crisis, with rhino poaching in South Africa alone up 9300% since 2007. To combat this, the International Humane Society partnered with an organisation called Protect to support Project RAPID (Real-time Anti-Poaching Intelligent Device). This device, implanted into the horn of a rhino, combines satellite signals and heart rate monitors to alert authorities whenever a rhino is in distress. A camera, implanted into the rhino’s secondary horn, can help authorities see if an animal is hurt or has been killed, and track it with GPS. If rhino-cams aren’t enough, how about receiving a text from your local elephant herd? Elephant populations plummeted 30% last year alone and face extinction by 2020, overwhelmingly from poaching and habitat loss. To combat this, conservation teams in Africa are tagging elephants with smart micro-chips, with the ability to send automatic alerts if the herd are close to danger-prone areas, or if poachers are veering them from their usual path. For the animals that have been lost, DNA profiling is being used to locate the source of their ivory and focus more efforts in the area to stop it. Smartphone tech could also be the solution to saving seals. Scottish scientists, faced with a 90% decline in the population of harbour seals since 2000, partnered with Vodafone to use the same GPS technology in smartphones to track seal movements and activity. By attaching trackers to the seals, then analysing the data, scientists found a link between common feeding grounds and a neurotoxic red alga. Research is continuing to see how to save the furry mammals. That’s just one of the ways big data might solve our endangerment problem. IBM thought so when it created its environmental algorithm technology, capable of sorting the huge volume of herd and movement data and mapping out conservation efforts accordingly. This ‘predictive analytics’ model was used to inform solutions to save endangered zebras, giving the Marwell Conservation Society a more detailed understanding of how zebras move and how best to save them from poaching. In 2013, big data giant HP teamed up with Conservation International to improve the accuracy and speed of conservation data. Using a series of drones, camera, sensors, and computing technology, it collected more than 3 terabytes of critical environmental data, 2 million photos, and 4 million measurements within a year, all organised by a simplified virtual dashboard that ecologists across 30 countries can access. Cisco and Dimension Data recently jumped in on the action, joining forces to install Wi-Fi hotspots around animal reserves to power drones. These drones, enabled with infrared and thermal imaging cameras, plus vehicle tracking sensors and seismic IoT sensors, are a multi-layered safeguard for animals in danger, with the added ability to identify and stop poachers in their tracks. Drones have given us unprecedented access to the skies, where researchers can monitor the environment in ways never thought possible. When equipped with cameras, environmental workers can get a birds eye view of our surroundings at any time they choose. But when equipped with a vast array of sensors, thermal imaging, AI-bots, and geographic trackers, conservationists have the tools to completely redefine how they approach their work. A European ecology team recently created a ‘conservation drone’ complete with sensors, GPS data, and a 50-minute flying time to identify deforestation threat zones and monitor the population of orangutans in Sumatra. As a low-cost solution (around $2,000), the accessible tech could be used to efficiently fight deforestation and habitat-loss in South East Asia. Over in Europe, a Dutch company called Birds.AI is developing artificial intelligence that can recognise these shapes from above – from whales to rhinos to trucks – to assist with this hardware. 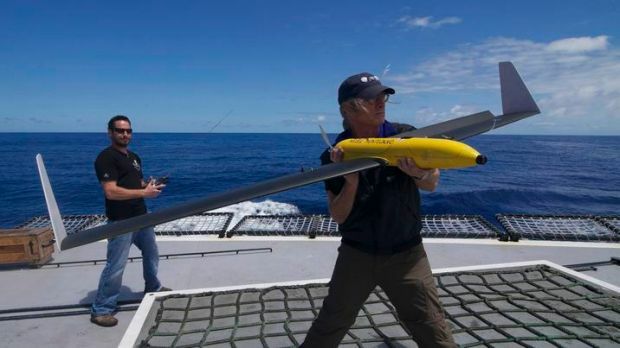 A little closer to home, Australian conservation group Sea Shepherd Conservation Society began using drones in 2011 to track illegal whaling vessels and relay the information to inform their stopping strategy. By finding out whaling ships’ location and size, its volunteers could deploy two ships (the Bob Barker and the Steve Irwin) to investigate, take images, and move to either prosecute illegal operators in international courts, or move on to more, ahem, stronger methods of deterrent (the Steve Irwin has a very sturdy hull). More recently, they have been using the Phantom DJI drone to track and monitor whales themselves, while deploying the ‘Snot Bot’ – an appropriately named device which can fly over a whale and collect the DNA, bacteria, and hormones released when they exhale from their blowhole – to learn more about them. They’re even using surrogate whale-imitation drones that can document their movements, sounds, and vision with a series of cameras, microphones, and sensors to learn more about these magnificent creatures. There are a slew of new ways IoT is helping endangered species: from automated microphones that can recognise multiple bird noises at a time and understand how populations are rising/falling, to smart collars which track mountain lions with GPS and accelerometer technology (the same that products like Google Maps or Uber use) to understand fast-moving animals and predict their behaviour, and IoT-enabled bee-hives that can halt the rapid loss of bees around North America. With new inventions popping up almost weekly, it’s clear that IoT tech has the power to change the planet. This fight is just the beginning. As Editor at Red Wire, Camilla is particularly passionate about diversity in tech, content marketing, social media, and disruptive platforms.